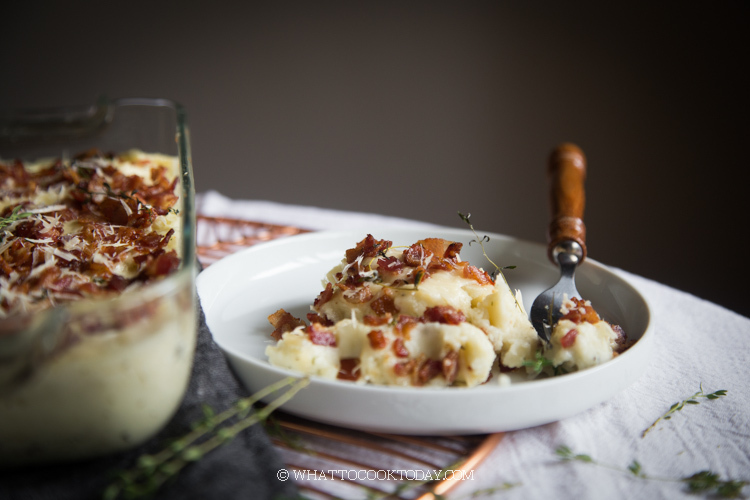 Super Easy Mashed Potato Bacon Thyme Gratin made with Idaho Spuds VeggieMash topped with crispy bacon and aromatic thyme will quickly become your family favorite. Click on the tags in the above image to shop directly! 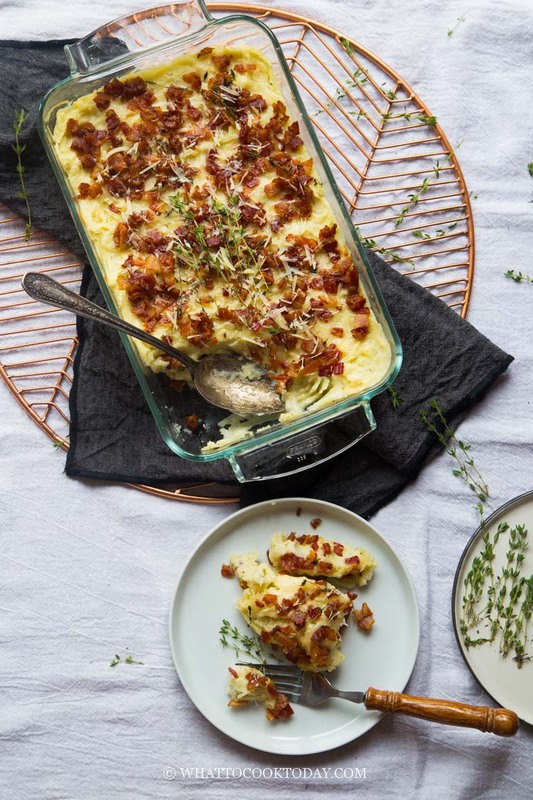 Mashed potatoes is one of the dishes that many people find comfort in, including our family and I can’t be more excited to share with you guys this super easy mashed potatoes bacon thyme gratin using Idaho Spuds VeggieMash. All Idaho Spuds products start with 100% Idaho® Potatoes. That’s a real deal to me! The Idaho Spuds’ new VeggieMash is also made with real vegetables. Oh yes..not only you have tasty potatoes, but also real vegetables that even picky eaters won’t notice when they eat. Thanks to Idaho Spuds VeggieMash, we cut out the work for making mashed potato from scratch. All you need to do is mixed Idaho Spuds VeggieMash with boiling water and you have smooth creamy mashed potatoes in no time. Don’t take my words for it. Try them! These mashed potatoes can be served as a meal. Thanks to VeggieMash, I don’t have to cook another vegetable side dish. I used VeggieMash Mashed Potatoes with Cauliflower & Ranch for this recipe but I’ve also tried Cauliflower,Butter & Herbs, and Broccoli & Cheddar varieties as well. I love all the varieties and have made several dishes using them. Click HERE to check where you can buy VeggieMash in your local stores. 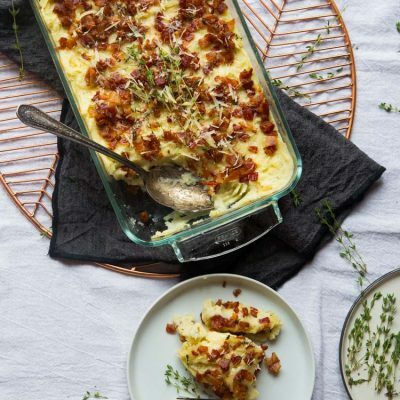 Whether you are trying to get your family to eat more veggies, or simply looking for easy tasty mashed potato recipes, this Super Easy Mashed Potatoes Bacon Thyme Gratin will certainly fit the bills! 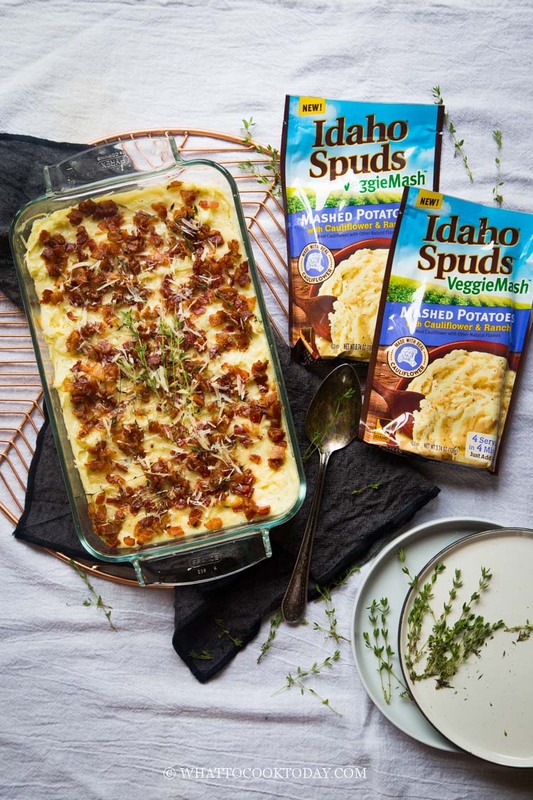 Idaho Spuds is giving away an assortment of Idaho Spuds VeggieMash product to 20 lucky winners from August 20, 2018 to September 9,2018. Check out the Idaho Spuds Facebook page! Check out the Idaho Spuds Instagram page! Transfer the mashed potato to about 12×12 inch baking dish, about 2-3 inches deep. Sprinkle with bacon bits you made earlier followed by the rest of the grated Parmesan cheese. Have you tried VeggieMash? What’s your favorite dish to make with VeggieMash? I’m all ears! !